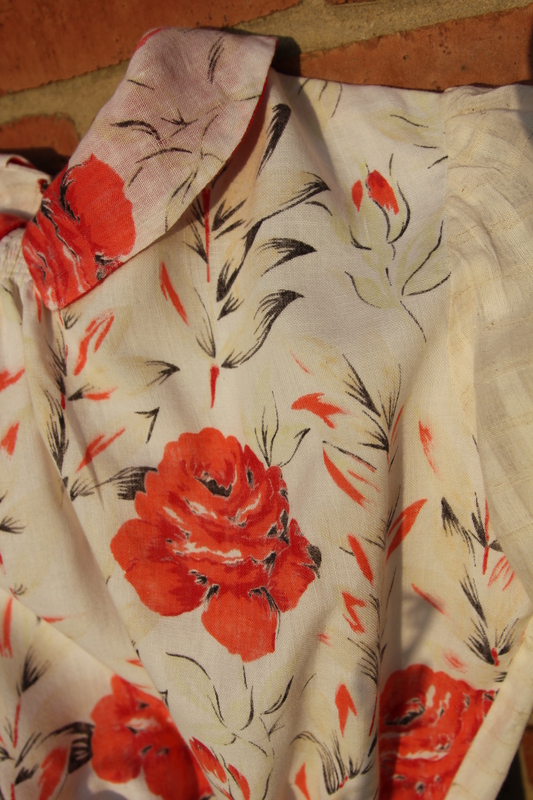 In remnants of red gauzy linen, cream checked cotton and a uneven oblong of flowery vintage something. The pattern I used was the ‘1930s’ Blouse’ from the book that tied-in with second series of the Great British Sewing Bee – ‘The Great British Sewing Bee: Sew Your Own Wardrobe’. Don’t have the book? Here is where you can download the patterns from the publisher. Not being able to muster the required 2 metres of fabric to make the full length blouse, peplum and all, I managed a two thirds maybe three quarters version: There’s an extremely minimalist peplum and a zip instead of a true-to-the-era placket, hook and bar. Sewcialists! Will this suffice for a last minute entry to Scraptember? Previous Post Nautical but Nice? Absolutely! Your scraps look beautifully cohesive! Thank you, they all had to wait quite some time for their appropriate partners! Looks lovely and it is almost better for the inclusion of other cloth. I really like the pattern, and the fabric. Thanks, all over flowers might have been too much even for me! Very pretty and a great use of scraps – so satisfying to put them to such a good use. Definitely satisfying, I waited ages to use those faded old flowers! Wow, that’s absolutely gorgeous. Elegant and stylish and pretty and feminine and flattering. Can you tell that I envy your sewing skills? Thanks! It’s a bit of a departure from my usual style. As a rule I’m not partial to a peplum, even one this short! I love the flower print, how clever combining it with the cream. You’ve just reminded me that I wanted to try this pattern! Thank you. Your version looks fabulous. Love the mix of fabrics, now I need to go get the pattern! Ah, thanks! I had a few problems with the pattern if I remember rightly. I think that there were some gathering markings missing and I couldn’t make much sense of either the placket or the sleeves. I still like the fabric though, it’s a shame there wasn’t more of it! Downloading the pattern now so I’ll look out for the points you noted. Hopefully I’ll get to make it soon, I’ve just returned to full time employment and I must confess it’s interfering with my sewing time!! !